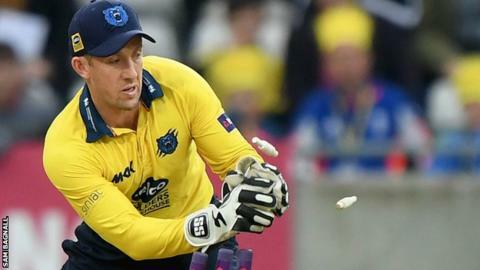 Leicestershire have signed New Zealand wicketkeeper Luke Ronchi for their 2017 T20 Blast campaign. The 35-year-old replaces Pakistan international Sharjeel Khan, who has been provisionally suspended from the Pakistan Super League as part of an ongoing anti-corruption investigation. Ronchi has played 32 T20 internationals and can play in all 14 T20 group games. He has previously played in England for Somerset and Warwickshire, as well as touring with New Zealand. "It seems like an exciting time at the club with a few personnel changes and talented additions," Ronchi said. "I love playing county cricket and can't wait to get started. "I hope I can make a difference both on and off the field and contribute to a successful campaign."